Today India is celebrating one of it biggest festival 'Diwali' or 'Deepawali', the festival of light. This reminded me of "Jashn-e-Charagan" a similar festival of light celebrated at Khanqah-e-Niyazia Bareilly. Jashn-e-Charagan is being celebrated at the Khanqaah for the last 300 years. Hazrat Qibla Shah Niyaz (R.A.) received bashaarat (massage) from Hazrat Gaus-ul-Aazam Sheikh Abdul Qadir Jeelani (R.A.) to organize charaagan on His name on 17th Rabi-ul-Sani ( The day of visaal of Hazrat Ghaus Paak R.A.) and informed him that on this day if somebody makes a legal wish, by the grace of Allah it will be fulfilled within one year. 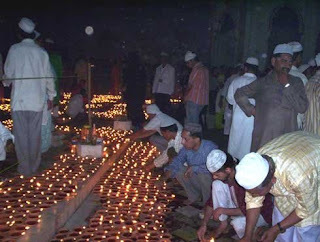 From that time this festival of light is constantly celebrated at the khanqaah. 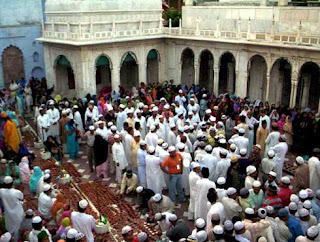 People from various parts of India, irrespective of there religion,caste & language visit the Khanqaah on this day, some even come from abroad.Some come to make a wish and to request for their desire to be fulfilled and some come to convey their regards after their wishes are fulfilled. sarkhar mai aap ka gulam hu mai banaganapalli se hu, mera nam mohammed haneef hai. Mera sawal a hai ke muje la illaha elallahu ke marefath ke bare me bath e a .
muje aisa wazifa batha e a ki mere rohani takhat bade. Kisi Wali Ullah ke mureed ho jaen,Allah behtr kare ga.